Global Recycling Equipment & Machinery Market size was estimated over USD 750 million in 2017 and will exhibit growth of over 6% up to 2025. 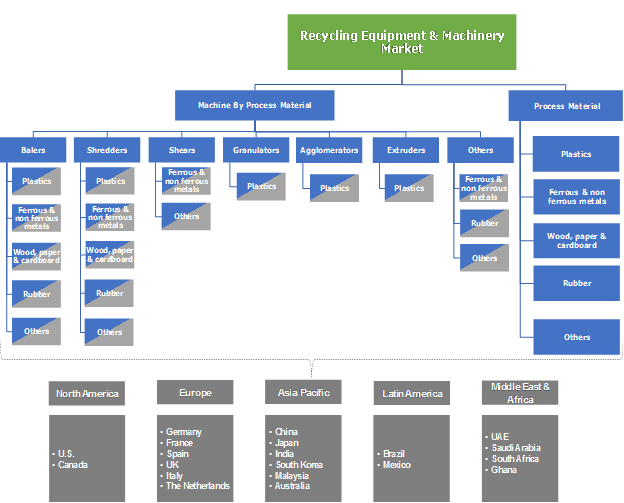 The recycling equipment & machinery market is strongly driven by global steady demand in use of recycled materials such as iron, steel, aluminum, plastic, concrete in automotive, building & construction, industrial machineries & other electrical equipment. Also, the secondary production of various metals through recycled metal becomes less expensive which enables efficiency in the process. This economic advantage of recycled materials is expected to boost the demand of recycling equipment & machinery market. Scrap materials such as discarded automotive parts, electronic devices, construction materials, electrical goods are usually collected from various sources such as scrap collection companies, dealers, brokers, industrial manufacturers, individuals, municipal organizations by major recycling companies. Further reduction in size & shape of the scrap is done by these major recycling companies which possess recycling equipment & machinery such as baler presses, shears, granulators, shredders among others. With rise in environmental awareness among European companies especially from Germany, Italy, UK, Netherlands a strong demand of recycled equipment & machinery is expected during forecast period. Currently European region is the largest recycler of plastics globally and will be over the next 3-5 years, and regions such as Middle East & Africa as well as Latin America are expected to take pace to reduce the greenhouse gases and increase usage of recycled materials. Recycling equipment & machinery used for recycling of paper presents a significant opportunity especially in developed countries of U.S., Canada, Belgium, Austria because of strong recycling infrastructure and high environment awareness. Recovered or recycled paper accounts for almost 35 - 38% of the total U.S. pulp supply and this ratio is expected to rise in forecast period, as the recovery rate of waste paper in the U.S. & Canada has almost doubled in last 5 years. Europe on the other hand witnessed an average paper recycling rate of almost 75% with countries such as Austria & Belgium achieving about 90% while other countries such as The Netherlands, UK had almost 80% of recycling rate. While, the recycling rate in Eastern Europe & other regions are still lagging in terms of paper recycling because of inadequate recycling infrastructure. The demand of recycled paper has also increased by a fivefold in India, China, Malaysia, Vietnam because of rise in e-commerce & export activities. The Chinese e-commerce industry is growing by 25% each year to reach a USD 1 trillion market during the forecast period which itself represents a huge opportunity for the recycled paper industry. India also represents a strategic market for recycled paper during the forecast period as only 20% of the total paper used is being recycled as compared to Japan where it is almost 60%. Plastic is one of the most recycled material globally and the rate of recycling is expected to rise by a phenomenal rate during the forecast period especially in developed countries of Europe. The machines used in the recycling of plastics are mainly baler presses, granulators, extruders & agglomerators. Almost 35-40% of the total recycling equipment & machinery sold globally cater to recycling of plastics made from LDPE, HDPE, LLDPE, polyester, nylon etc. With advancement in automation & technology in these machines, the recycling business is expected to become simpler & lucrative in the coming years. Baler presses are one of the important recycling equipment & machinery used in the global recycling business. These machines can handle varied scrap materials such as rubber, iron & steel, plastic, concrete, textile fabrics efficiently and is available according to customized configurations. These machines constitute about 25-30% in the total volume of recycled equipment & machinery sold globally. Shredder is another important type of recycling that is widely used for recycling of tires and plastic to some extent. The demand of shredders is expected to grow at a significant rate because of strong demand of tires from the Off the Road “OTR” segment especially in countries such as Australia, India, China, U.S., Brazil, Chile where there are huge mining activities taking place. The other machines that are considered in the report are hammer mills, crushers which have a different technical configuration from shredders & shears. These machines find application in crushing various materials such as end of life vehicles, concrete among others. The major materials which are recycled globally are iron, steel, aluminum, copper, zinc, plastic polyethylene, polyester, rubber, concrete, textile fabrics, glass among others. Ferrous & non-ferrous materials have the highest recycling rate followed by plastic. Recycled metals find wide applications in appliances, building materials such as rebars, for packaging food items especially aluminum cans, components for home furnishing among others. Recycling of rubber is an important market for recycling equipment & machinery market as millions of tires are discarded every year across the globe and disposal of these waste tires has been a challenging task as they are non-biodegradable. With stringent rules globally regarding handling waste rubber activities such as stockpiling, landfilling & dumping has been an issue. With rise in awareness among consumer & manufacturers regarding environment protection the demand of ecofriendly rubber is expected to rise significantly which in turn will drive the demand of recycling equipment & machinery. The demand of these machines is also expected to rise due to increase in demand of recycled concrete for various building & construction applications. As Europe & North American region have the highest rate of recycled materials globally the total population of recycling equipment & machinery is significantly higher as compared to regions of Asia Pacific, Latin America & Middle East. However, with rising awareness & stringent regulations in these developing regions, the demand of recycling equipment & machinery is expected to remain higher than the developed regions during the forecast period. With rising regulations in Middle East regarding regulation of illegal dumping of rubber tires, the demand of recycling equipment & machinery is expected to grow at a significant rate over the forecast period. In Africa, countries like Ghana, South Africa, Nigeria, Kenya have started to recycle plastics & metals on a small scale with rising awareness about the benefits of recycling materials & return from the business. Some of the players operating in the recycling equipment & machinery market are Lefort, Danieli Centro Recycling, Morita Holdings Corporation, Forrec Srl Recycling, BHS Sonthofen, Panchal Plastic Machinery Private Ltd, Mid Atlantic Waste Systems, Idromec Spa among others. 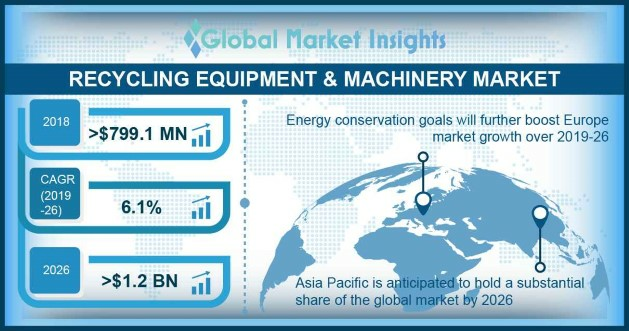 The recycling equipment & machinery market is highly fragmented with each manufacturer offering various product lines along with customized solutions catering to various groups of customers in small scale to large scale recyclers. Constant innovation, developing high efficiency recycling equipment & machinery along with automation will drive the recycling equipment & machinery industry globally.